"Dunwoody" redirects here. For other uses, see Dunwoody (disambiguation). 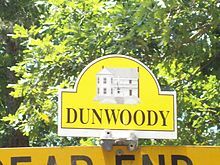 The Dunwoody area was established in the early 1830s and is named for Major Charles Dunwody (1828–1905), an extra "o" added with the incorrect spelling of the name on a banking note. Charles Dunwody originally returned to Roswell after fighting in the Civil War, in which he fought for the Confederates. On account of the railroad, Dunwoody developed into a small crossroads community. The community continued to grow and prosper even after the railroad shut down in 1921. Dunwoody remained rural until suburban residential development was initiated in the 1960s. In 1971, the Spruill family sold a large portion of their property for the construction of Perimeter Mall, with the completion of Dunwoody Village occurring the same year. In early 2006, a study was conducted by the Carl Vinson Institute of Government of the University of Georgia, to determine how feasible it would be to incorporate Dunwoody as a city. Critics claimed that incorporation of Dunwoody, as in the incorporation of Sandy Springs in 2005, would take away a great deal of tax revenue from the rest of the county, leading to shortages of services, tax increases, or both for everyone else in the county, as has happened in Fulton. Citizens for Dunwoody, Inc. was the non-profit advocacy group begun by Senator Dan Weber to promote the effort. The bill for incorporation was withdrawn from the Georgia General Assembly for further study in 2006 and passed only the lower house in 2007. In 2008, the bill of incorporation was re-introduced by Senator Weber, and due to increased pressure, it passed in the senate as well as the house. Georgia Governor Sonny Perdue signed the bill allowing the residents to vote for a city of Dunwoody on March 25. The referendum for cityhood, which took place on July 15, was approved by an overwhelming majority of voters. The Dunwoody City Charter was later ratified by the Georgia General Assembly, and on December 1, 2008, after a three-year movement, Dunwoody officially became a city. Dunwoody's geographic center is at 33°56′34″N 84°19′4″W﻿ / ﻿33.94278°N 84.31778°W﻿ / 33.94278; -84.31778 (33.942751, -84.317694). According to the United States Census Bureau, Dunwoody has a total area of 13.2 square miles (34.1 km2), of which 12.9 square miles (33.5 km2) is land and 0.23 square miles (0.6 km2), or 1.72%, is water. Dunwoody lies at the northern tip of DeKalb County, bounded by the Fulton County line on the north and west, Interstate 285 on the south, Peachtree Industrial Boulevard on the southeast, and the Gwinnett County line on the northeast. 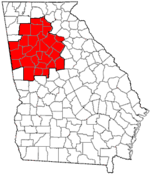 A small portion of Dunwoody is included in Gwinnett County. Late on April 8, 1998, a major tornado tore through parts of Dunwoody, running east-northeast from Perimeter Center and into Gwinnett County. Thousands of homes were damaged, hundreds seriously, and several dozen were condemned. In addition, tens of thousands of native forest trees were downed. The vast majority of the tornado's damage occurred here, leading it to be called the "Dunwoody tornado", the most vivid in local memory until the 2008 Atlanta tornado. Perimeter Center is the major edge city and neighborhood that has formed around Perimeter Mall. The mall was developed in 1971, spurring major office, residential, and commercial developments in the decades since. It is one of Metro Atlanta's largest job centers, employing hundreds of thousands of people each day. Perimeter Mall and approximately 40 percent of the Perimeter Community Improvement District, is a self-taxing district of shopping and office buildings (including several high-rises), are both located in Dunwoody. The western part of Perimeter Center edge city spans the Fulton county line into Sandy Springs. The tallest building in Dunwoody is the 34-story Ravinia 3, at 444 feet (135 m). Perimeter Center is located at the intersection of two major highways, GA 400 and I-285. The Dunwoody Transit Station provides public transit to the district. Georgetown was developed in the early 1960s. It is located near I-285 and borders with the city limits of Chamblee. Overdevelopment in Georgetown was one of the main reasons for the initiation of Dunwoody's incorporation movement, with many new apartments being approved for the area, even in some single-family residential areas. Georgetown, one of the most walkable areas of the city, contains both single-family residential subdivisions and its own retail district. This includes Kroger, who also owns and manages the property. The Williamsburg commercial district is located on the eastern edge of Dunwoody, adjacent to the Dunwoody Panhandle of Sandy Springs. Shopping areas include Orchard Park Shopping Center, Mt. Vernon Shopping Center and the Williamsburg at Dunwoody Shopping Center. The centralized dining and shopping covers the intersection of Mt. Vernon, Dunwoody Club Drive, and Jett Ferry Road. Winters Chapel is located at Dunwoody's border with Peachtree Corners. The district shares a name with its main road, which travels through Fulton, Gwinnett and DeKalb County and was an important 19th century route connecting Decatur and Roswell via Holcomb Bridge Road. The district is named after Winters Chapel (now Winters Chapel Methodist Church), which has resided at its present location since the 1870s. The church itself is named after an instrumental founder, Jeremiah Winters. The area is a prime location for light commercial and retail redevelopment opportunities due to good demographics and traffic counts. Two parks, connected by sidewalks, dominate Winters Chapel. The 3/4 mile long, meticulously groomed, linear park running along DeKalb County's Twin Lakes water reservoir on Peeler Road is popular with walkers and joggers. Windwood Hollow Park, at Lakeside Drive and Peeler Road, offers tennis, a children's play area, a picnic pavilion, and a short trail. Tilly Mill is named after the pioneer Tilly family, who owned a late 19th-century farm and mill on land bisected by Tilly Mill Road, which connects Dunwoody to Peachtree Industrial and Doraville. Landmarks in the area include the Dunwoody campus of Georgia State University's Perimeter College and Dunwoody's signature park, Brook Run. Brook Run, on North Peachtree Road near its intersection with Tilly Mill Road, boasts many wooded walking trails, a children's play area, a dog park, a Veterans Memorial, and a community garden. The 103-acre (0.42 km2) site will see major improvements as Dunwoody plans for its future. Also in Tilly Mill is the Marcus Jewish Community Center, an Orthodox synagogue, and a significant portion of Dunwoody's Jewish population. Interstate 285, also called The Perimeter, runs along the city's southern border. A limited access portion of Georgia State Route 141 runs along the southeastern border. Georgia State Route 400, while in neighboring Sandy Springs, is very close to the city's western border. The Metropolitan Atlanta Rapid Transit Authority (MARTA) provides subway and bus service to Dunwoody and the surrounding area. MARTA subway stations in Dunwoody are concentrated in the western part of the city. The Dunwoody station is the only station within the city limits, although Medical Center, Sandy Springs station, and North Springs station are very close to the western border. All stations in the area are served exclusively by the Red Line. While some routes serve the outskirts of the city, there are three main bus routes, one of which leaves from the Dunwoody Station (Route 150). Route 103 - Peeler Rd./N. Shallowford Rd. As of the census of 2010, there were 46,267 people, 19,944 households, and 11,723 families residing in the city. The population density was 3,421 people per square mile (1,304/km²). There were 21,671 housing units at an average density of 1,582 per square mile (611/km²). The racial makeup of the city was 69.8% White, 12.8% African American, 0.3% Native American, 11.1% Asian, 0.1% Pacific Islander, 3.6% from other races, and 2.3% from two or more races. Hispanic or Latino of any race were 10.3% of the population. There were 19,944 households out of which 29.9% had children under the age of 18 living with them, 47.8% were married couples living together, 8.1% had a female householder with no husband present, and 41.2% were non-families. 29.9% of all households were made up of individuals and 6.3% had someone living alone who was 65 years of age or older. The average household size was 2.31 and the average family size was 3.0. The population was spread out with 23.4% under the age of 18, 2.0% from 18 to 21, 62.3% from 22 to 64, and 12.3% who were 65 years of age or older. The median age was 35.7 years. For every 100 females, there were 92.8 males. For every 100 females age 18 and over, there were 89.7 males. The median income for a household in the city was $76,809, and the median income for a family was $106,777. Males had a median income of $78,778 versus $51,081 for females. The per capita income for the city was $45,484. About 6.2% of families and 7.9% of the population were below the poverty line, including 10.2% of those under age 18 and 3.1% of those age 65 or over. The city has a council-manager form of municipal government. Its first mayor was Ken Wright. The current mayor is Denis "Denny" Shortal, elected in November 2015. The city manager is Eric Linton. Dunwoody's city hall is located at 4800 Ashford-Dunwoody Road from early 2018, after the property was purchased by the city in 2017. The city was renting a space in a Perimeter Center office building at 41 Perimeter Center East for several years prior. City Hall was originally at a temporary location in the city of Sandy Springs for most of the city’s first year. Dunwoody operates its own police force of 54 officers, as well as departments over zoning and land use. The city receives services from DeKalb County including: DeKalb County Schools, Dekalb County Fire & Rescue, sanitation, water, and sewage. Three Ravinia Drive (far right) is the tallest building in Dunwoody. The Atlanta Journal-Constitution has its headquarters in the Perimeter Center and in Dunwoody. In 2010 the newspaper relocated its headquarters from Downtown Atlanta to leased offices in the Perimeter Center for financial reasons. InterContinental Hotels Group operates its American corporate offices in Dunwoody. The DeKalb County School System (DCSS) operates local public schools. American InterContinental University (AIU Dunwoody) Just across the county line in neighboring Sandy Springs. DeKalb County Public Library operates the Dunwoody Branch. Pat Swindall, lived in Dunwoody while serving in the US Congress. ^ Hunt, April (2008-11-30), Atlanta Metro News. Retrieved on 2010-10-19. ^ a b "Geographic Identifiers: 2010 Demographic Profile Data (G001): Dunwoody city, Georgia". U.S. Census Bureau, American Factfinder. Retrieved October 21, 2015. ^ A history and genealogy of the ... - Google Books. Books.google.com (2007-04-20). Retrieved on 2010-10-19. ^ The life of Theodore Roosevelt ... - Google Books. Books.google.com (2007-07-18). Retrieved on 2010-10-19. ^  Books.google.com (2010). Retrieved on 2010-18-11. ^ Dunwoody Homeowners Association … About … History. Dunwoodyga.org. Retrieved on 2010-10-19. ^ About Dunwoody Archived 2009-04-04 at the Wayback Machine. Dunwoodyga.gov (2008-12-01). Retrieved on 2013-09-06. ^ a b Dunwoody resident tracks Village Mill history - Dunwoody Crier: Past Tense. Thecrier.net (2007-07-17). Retrieved on 2013-09-06. ^ Under Construction. Citizensfordunwoody.org. Retrieved on 2010-10-19. ^ sb82.html Archived 2009-02-12 at the Wayback Machine. Legis.ga.gov. Retrieved on 2010-10-19. ^ About Dunwoody Archived 2009-04-04 at the Wayback Machine. Dunwoodyga.gov (2008-12-01). Retrieved on 2010-10-19. ^ The Dunwoody Crier - Front. Thecrier.net (2010-09-28). Retrieved on 2010-10-19. ^ Home Page. Perimeter Community Improvement Districts. Retrieved October 27, 2008. ^ Perimeter Community Improvement Districts Archived 2012-09-06 at Archive.today. Perimetercid.org. Retrieved on 2010-10-19. ^ The Dunwoody Crier - News. Thecrier.net (2010-09-23). Retrieved on 2010-10-19. ^ a b c The Dunwoody Crier - Front. Thecrier.net (2010-01-05). Retrieved on 2010-10-19. ^ Baptis? Methodist? The Winter's the same - Dunwoody Crier: In My Opinion. Thecrier.net (2005-02-08). Retrieved on 2013-09-06. ^ Street name answers - Dunwoody Crier: Past Tense. Thecrier.net (2010-02-02). Retrieved on 2013-09-06. ^ The Dunwoody Crier - Past TenseColumnists. Thecrier.net (2010-04-06). Retrieved on 2010-10-19. ^ "Red Line Map: Red Line". itsmarta. Metropolitan Atlanta Rapid Transit Authority. Archived from the original on 23 July 2015. Retrieved 22 July 2015. ^ "Bus Information by Route Number". itsmarta. Metropolitan Atlanta Rapid Transit Authority. Retrieved 22 July 2015. ^ "Chamblee Dunwoody Road Georgetown Gateway". Dunwoodyga.gov. 2008-12-01. Retrieved 2018-07-11. ^ "Perimeter Multi-Modal Trails". Dunwoodyga.gov. Retrieved 2018-07-11. ^ "Northside to get its version of the BeltLine trail". ajc.com. Retrieved 9 April 2018. ^ "Winters Chapel Corridor Multiuse Trail". Dunwoodyga.gov. 2008-12-01. Retrieved 2018-07-11. ^ "Denis "Denny" Shortal | Candidate for Mayor of Dunwoody". www.denisshortal.com. Retrieved 2017-05-03. ^ a b "Map of Dunwoody". City of Dunwoody. Archived from the original on September 19, 2010. Retrieved September 29, 2010. ^ a b Collier, Joe Guy (August 17, 2009). "AJC moving from downtown to Perimeter Mall area". Atlanta Journal-Constitution. Retrieved October 23, 2009. ^ "Contact us Archived 2010-02-08 at the Wayback Machine." InterContinental Hotels Group. Retrieved on March 5, 2010. ^ "City of Dunwoody 2011 Comprehensive Annual Financial Report". calameo.com. Retrieved 9 April 2018. ^ Rodney Ho (1 March 2016). "Former Atlantan Erin Andrews cries during peephole video lawsuit testimony". Atlanta Journal-Constitution. Retrieved 29 March 2017. ^ Jill Vejnoska (3 March 2016). "Some scoop on Bret Baier's Atlanta days before tonight's Fox News debate". Atlanta Journal-Constitution. Retrieved 29 March 2017. ^ Robin Meade. "Robin Meade Blog". Retrieved 29 March 2017. ^ Barone, Michael; and Ujifusa, Grant. The Almanac of American Politics 1988', p. 297. National Journal, 1987. ^ Wayne Fishell (5 November 2016). "Cindy Wilson, Beyond the B-52s". Left Magazine. Retrieved 28 March 2017. Wikimedia Commons has media related to Dunwoody, Georgia. Wikivoyage has a travel guide for Dunwoody.